Building on the timeline we began, I found some great visuals so you can see at a glance, the different ways God counts time in the Bible. These charts show what would take me many words to say. Word for word, this should only take you about 15 minutes. The last chart is the most important one for our timeline, please don't miss it, but I really want you to read everything here, we're building line upon line to a conclusion. The end of this lesson, which will show you how close we are to the first Rapture/ Resurrection and the last 10 years before Jesus returns, won't mean much if you don't see how we arrived at that conclusion. I've kept it ASAP (as SHORT as possible). sets of 7 years, and Millenniums. Millennial Reign of Jesus, Satan causes Trouble again, Eternity. 4 distinct periods called Dispensations (the way God set up for man to rule himself). Conscience = during this period, man was ruled by his conscience which wasn't very moral or just. Law = Gad gave Moses the Law for man to use to govern himself with. Impossible to totally keep. Kingdom under Christ = A combination of all three under Jesus as judge. We are on our way here! In the beginning... Evening and Morning were the first day! Evening is always first. Evening is a time of trouble. The last years of the end times is so full of trouble, it is often referred to as NIGHT in Scripture. In the chart above, each 1000 yr day begins with trouble, it begins with evening. Notice these evening troubles. 7th evening = Antichrist and the Tribulation We will soon begin this evening. The three days = 3,000 yrs pattern in this chart below, also fits with the resurrection of God's people on the "third day" (Hosea 6:2) at the beginning of the third Millennium, when resurrection is expected. 7th evening = Antichrist and the Tribulation We are about to begin this evening. Hosea 6:2 After two days he will revive us. On the third day he will raise us so that we may live in his presence. The first rapture/ resurrection happens on the third DAY, the Tribulation begins That Evening! In the chart below, we will look at another unit of time that goes along with the "1000 years as a day" pattern, it is the jubilee. This is the pattern we have been looking at for the "days of man." The Lord told Moses that He would only strive with man for 120 years. Man's life did decrease in length right after the flood; though in Genesis 11 we find many people still lived longer than 120 years. Psalms 90:10 shows the life expectancy of man to be 70-80 years. Though there have been rough times and places on earth that have decreased this number for certain populations, in normal conditions the 70-80 year life expectancy has held true. 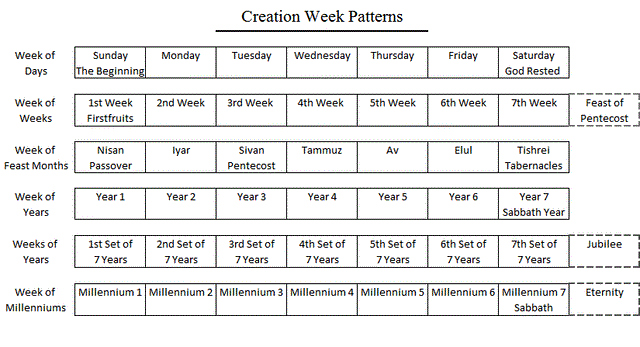 The Jubilee pattern is the weeks of years we see on the creation pattern above. It is a set of 7 yrs x 7 = 49 yrs. The 50th year is the Jubilee! 120 jubilees of 50 years end up matching the 6000 years of God striving with man's ways before Christ's rule on Earth. This next chart, is a compilation of all of the charts together with the Jewish Temple, same as the Temple of God in Heaven, at the center of the chart. 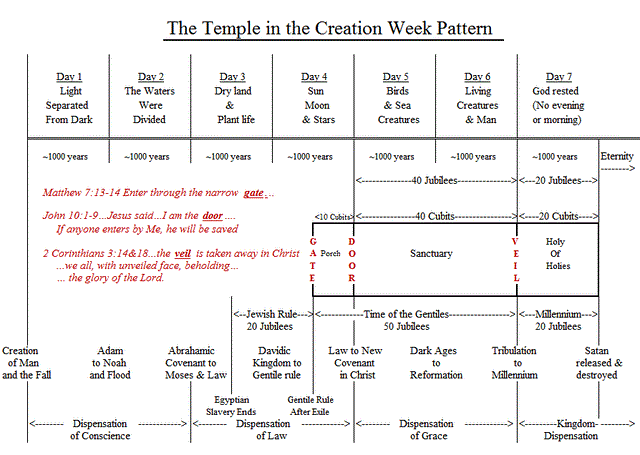 The dimensions of the Temple (center of chart below) hold the timeline for the Church age from her birth into the Tribulation and millennial reign of Christ (40 Jubilees). As we have studied before, "Temple at the Center of Time." Look below, the Temple is smack in the middle. I want to point out just a couple of things on the chart. Notice how the size of Temple in Cubits = Jubilee years. From the Jewish Rule (just before the Gate of Temple) up to the Tribulation = 70 Jubilees. From the GATE to Eternity = 70 Jubilees, then Satan brings war and trouble again, men follow him, then both are destroyed. God is showing the 70 year prophetic life span which ends with tribulation and destruction both times, on the chart. Now read the Scriptures in Red on the chart, and see how what Jesus said is a call for people to believe in and follow Him. Showing that Judeo - Christianity (gate of Jewish Temple) and Jesus Himself (the door) is the only way to salvation (the Sanctuary). The Veil (which hides God and spirit world from our physical view) will be lifted when Jesus returns and we go into the millennial reign under Jesus and we actually come Face to Face with God! But at the same time, Jesus is also prophesying in a hidden code, the last days timeline for those who have a relationship with Him and His Word. This is one of those "Let the reader understand" kind of things. You see, once you know that the "narrow gate" is and the "door" are part of the Temple, and place it in the timeline as above, it reveals itself. Now that you have this understanding of the many ways that God counts time, and you can visualize the importance of 70 be it Jubilees or just 70 years, we are ready to finish our timeline of how close we are. 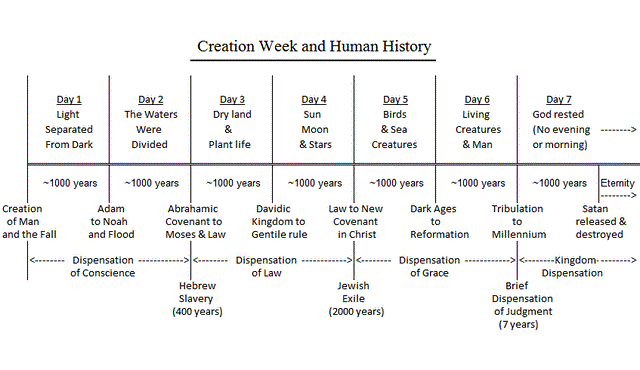 We will use this chart next lesson because it reveals God's Plan for Man, Big Picture and embedded within is the outline of God's Plan for Israel and the End-times Timing.